Our capabilities in solar production equipment, whether for crystalline silicon or thin films, are focused on helping our customers to improve yields while reducing cost per watt. For our innovative energy storage customers, safety and performance testing during the manufacturing process are the major concerns. Whether the need is for automated process modules, transit between modules, or turnkey production lines, Owens Design has the experience to service your needs. Solar cell binning station, conveyor input for cells, custom cassette output, overhead delta robot with integrated vision for positional and angular correction, part tracking, up to 7,000 cells per hour throughput, factory interface automatic cassette exchange. Li-ion battery module charging system test cell, 32 test bays serviced by 6 DOF track robot, high voltage DC supply, water cooling, automated electrical and water connections for test bays. Solar cell scribe and break system, coin stack input, laser scribe, mechanical break, 100% inline cell and strip vision inspection, 3,000 pph. 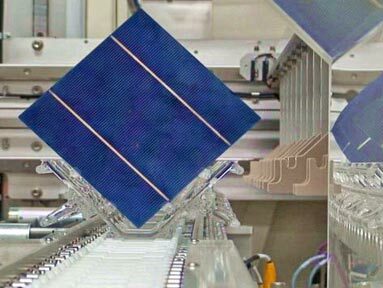 Flexible solar panel wet hi-potential test production line, maximum panel size 1.1 m wide x 6 m long, fully automated transfer, air knife dry, integrated hi-pot test instrumentation and data tracking. CIGS backend cell singulation and sorting system, integrated metrology, in-line solar IV testing, output binning, data tracking for up to 36 metrology parameters, max 3,600 pph. 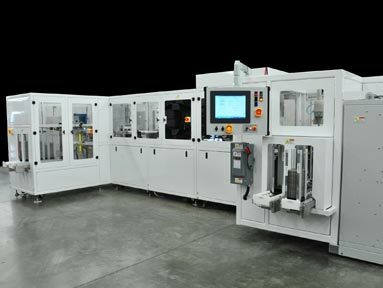 cSI incoming wafer metrology and binning system, standard cassette input with fully automated cassette exchange and buffering, modular sort and binning with up to 24 bins, 3,600 pph. POCL3diffusion furnace quartz boat loader, loads 5 standard quartz boats of 100 wafer each to furnace, up to 4 max of tubes. 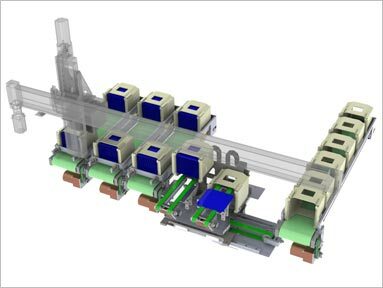 High energy implant doping of silicon ingots, 1.6m x 1.4m high vacuum processing chamber 10-5 torr, input and output load locks incorporating 1.4m wide slit valves, payload transfer of 700 lb using custom feed-throughs, liquid cooling system.